The Japanese cities Tokyo, Nagoya and Osaka will host Card Captor Sakura original art exhibitions at the end of this year and beginning of the next year. The exhibitions will be held to celebrate CLAMP’s 25th Anniversary and the 60th Anniversary of Nakayoshi, Kodansha’s magazine in which the manga originally ran from 1996 to 2000. In Tokyo, the exhibition will run from December 27th until January 4th; In Nagoya, from February 26th until March 3rd; and in Osaka, from March 21st until the 29th. Tickets will go on sale on November 1st. Limited goods will be available when purchasing advanced tickets. An official twitter account has been launched to promote the events. Source: comic natalie, CLAMP-NET.COM, Card Captor Sakura Gengaten. 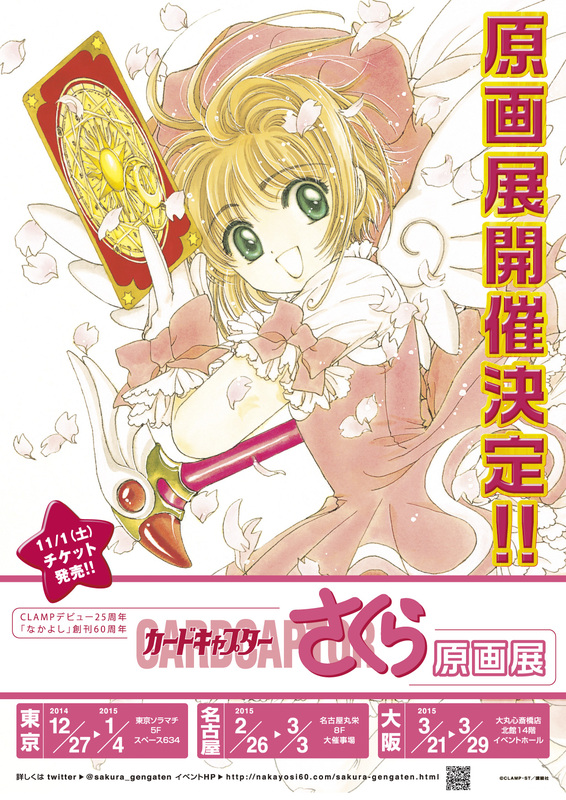 On related news, a Card Captor Sakura official online shop has been launched, along with its twitter account, as an attempt to gather in a single website some of the goods that were released during the past few months. And did you know? CLAMP have a new cat!